Ideally located in the curve of the crescent of Palm Jumeirah Island, Anantara Dubai The Palm Resort & Spa offers a private beachfront and luxury accommodation along with an excellent range of onsite facilities. Presenting a unique Thai style, the hotel boasts well-appointed rooms, a full service day spa and an extensive range of dining options. Close to a variety of local activities and attractions, the hotel is just minutes from Ski Dubai, Mall of the Emirates and AquaVenture and is only a short drive from Burj Khalifa and the airport. 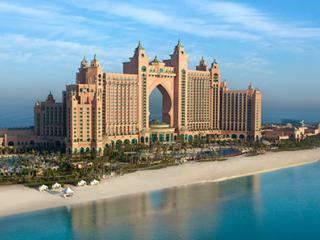 Located on its own private beach overlooking the Arabian Gulf, Atlantis The Palm offers an incredible range of luxury accommodation on Dubai’s famous Palm Island. Close to the Emirates Golf Club, Dubai Mall and a variety of excellent health spas, the hotel is home to an unbelievable range of onsite facilities including 22 bars, lounges, restaurants and dining experiences, an underwater aquarium, dolphin swimming encounters and AquaVenture Waterpark, an underwater labyrinth and the largest water park in the Middle East. Located on the famous Palm Jumeirah overlooking the azure Arabian Gulf, Jumeirah Zabeel Saray offers luxury accommodation on the West Crescent, boasting high ceilings, parquet floors and marble baths. Home to an outstanding range of onsite facilities, the hotel is close to a variety of local shopping, dining, activities and attractions including The Beach Mall, Dubai Marina Mall, Skydive Dubai and Aquaventure Water park. Enjoying a fantastic range of onsite facilities, the hotel boasts its own full service day spa as well as the largest Turkish bath in the Middle East. 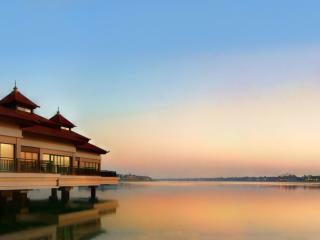 An oasis in the heart of Dubai, Sofitel Dubai The Palm Resort & Spa offers luxury accommodation on famous Palm Jumeirah. Boasting a unique Polynesian theme and an excellent range of onsite facilities, the hotel overlooks the Arabian Sea and is just a short drive from the Dubai International Airport. Close to a range of local shopping, dining, activities and attractions, the hotel is just minutes from the iconic Burj Khalifa, Atlantis Aquaventure Waterpark and the Dubai Mall. Hotels on this man-made archipelago offer a relaxing beachside setting close to activities and attractions including Jumeirah Beach, Wild Wadi Waterpark and the Burj Al Arab.